This newspaper clipping concerns the awarding of the Chase Senior Citizen Award to Dr. George H. Starke (1898-1978). The precise newspaper is unknown, but it is presumed to be The Sanford Herald. The year the award was given is believed to be 1974. 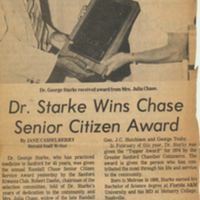 Original newspaper article by Jane Casselberry: "Dr. Starke Wins Chase Senior Citizen Award," The Sanford Herald: Dr. George H. Starke Folder, General Henry S. Sanford Memorial Library, Sanford Museum, Sanford Florida. Digital reproduction of original newspaper article by Jane Casselberry: "Dr. Starke Wins Chase Senior Citizen Award." The Sanford Herald. Originally created by Jane Casselberry and published by The Sanford Herald. Casselberry, Jane. “Dr. Starke Wins Chase Senior Citizen Award.” RICHES of Central Florida accessed April 25, 2019, https://richesmi.cah.ucf.edu/omeka/items/show/3066.